Journalist Panel Discussion on “Fake News”, Thursday, Nov. 15 2018 at 7 p.m.
Unitarian Universalist Church of Lexington, 3564 Clays Mill Road. There is a lot of talk about “fake news”. But what is it, really? How is it affecting political discourse? How can you tell reliable news from disinformation and propaganda? Journalists Elizabeth Hansen, Tom Eblen, and Ryan Craig provide their perspectives on this topic at the League of Women Voters’ general meeting. The journalists provided three handouts to help news consumers better evaluate news sources and understand journalistic integrity. 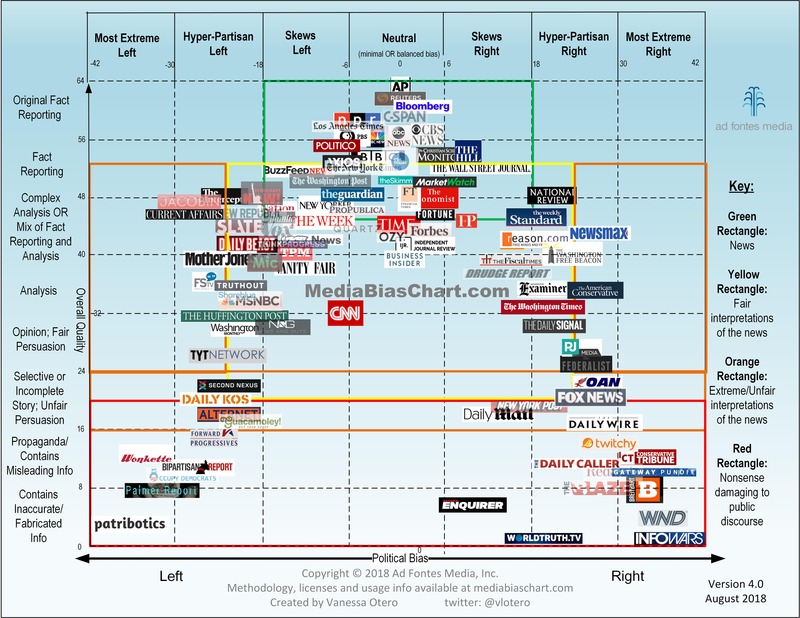 Media Bias chart by Ad Fontes Media, Inc.